FRENCHVILLE, Maine- After nearly 250 years, Evangeline and Gabrielle, the immortalized heroes of Henry Wadsworth Longfellow's tragic poem about the deportation of Acadians at the hands of the British, are getting their due. After more than a decade of trying to get Queen Elizabeth II of England to apologize for the ethnic cleansing brought about by the deportation of Acadians from Grand Pre, Nova Scotia, in 1755, the apology is being made. The deportation occurred between 1755* and 1763*, scattering French-speaking people into Maine and as far south as Louisiana**. * original text incorrectly indicates 1775 and 1783. ** no Acadians were actually deported to Louisiana. The first Acadians arrived in Louisiana in 1764 from New York after the war had ended and the Acadians had been given 18 months to leave the colonies. Others who had been imprisoned in Acadia and those who were in the colonies and the West Indies entered Louisiana between 1765-1770. In 1785, those who had been exiled to England and sent to France in 1763 and those who had been sent to France directly in 1758-1759 were allowed to go to Louisiana. Queen Elizabeth's apology comes through a back door by way of the Canadian Federal Cabinet, which approved the order this week. The proclamation will become official next week when it is signed by Governor General Adrienne Clarkson, the queen's representative in Canada. The British monarch recently deferred a decision on the requested apology to the Canadian Federal Cabinet, which endorsed the idea, and Clarkson's signing of the proclamation will make it official. "This is a royal proclamation, and it involves two very important things for Acadians everywhere," Euclide Chiasson, president of Canada's National Society of Acadians, based in Moncton, New Brunswick, said Thursday afternoon. "This is important because it makes historic records a fact, and the Crown is admitting it caused irreparable damages to the Acadian people. "There is no compensation involved, and we sought none," he continued in French. "This is a big victory, something we have been seeking for years." Chiasson said the action of the Federal Cabinet has made him a sought man. He has been conducting interviews with news organizations across North America and Europe. "This has generated interest all over the world. It's a great day for Acadians everywhere, in Canada, in Maine, in Louisiana and elsewhere," he said. "You must know there are Acadians in Maine because of the Grand Deportation that started in 1755. "This is formidable. This is what we have been looking for for years," he continued. "It is symbolic, it is important, much like a flag for a country." Chiasson said, like the Holocaust, there are people who claim the Grand Deportation never happened. Now it is historic fact, he said. "We're very happy that this has happened," Judy Paradis of Frenchville, president of the Maine Acadian Heritage Council, said Thursday, also speaking French. "It was something they could no longer refuse because it was an embarrassment to the Crown. "We totally supported the efforts of Canadian Acadians," she said. "We passed similar legislation in Maine some years ago." About 10 years ago, the Legislature passed a resolve asking for an apology from England, Paradis said. "We did that because we have such a large population of Acadians in Maine," the former legislator said. Paradis said the English Deportation Order of 1755, which forced the French out, has never been rescinded. It led to Acadian settlements up and down North America, including in Louisiana, and in the Caribbean. About 40 percent of Maine people have French roots, but not necessarily Acadian roots. Many are linked to Quebec, Canada. The last official request to the queen was made early in 2001, to which the Maine Acadian Heritage Council lent its support. The cause was taken up by La Societee National D'Acadie, or the National Society of Acadia. "This is what we have been asking for," Daniel Theriault, executive director of the New Brunswick Society of Acadians, an arm of the National Society of Acadia, said Thursday by telephone. "We wanted positive movement from England, and it has come in a proclamation from the Federal Cabinet. "The Royal Proclamation will be signed next week," Theriault said. "This will officially recognize what was done to Acadians." The proclamation will recognize July 28, starting in 2005, as the anniversary of the deportation order. Theriault said the queen will be asked to attend the anniversary at Grand Pre in 2005. The original request for an apology from the British crown was made by Warren Perrin, a Louisiana lawyer, more than a decade ago. In Louisiana, resettled Acadians became known as Cajuns. The Canadian Parliament defeated a similar request when the issue was raised in December 2001 by a member of Block Quebecquois, a separatist party in Quebec. In the deportation, thousands were taken from their lands, separated from their families and dispersed up and down the East Coast. Some also fled north, to what is now Fredericton, New Brunswick. A generation later, some of those Acadians moved into the St. John Valley in Maine. The lands left behind were confiscated and given by the British crown to loyal British subjects. Longfellow's poem "Evangeline" tells the story of two lovers who are separated by the deportation and only meet again as Gabrielle is dying. The National Society of Acadia was formed in 1881 and is a federation that includes provincial chapters in Canada. It also has liaison associations such as Action Acadienne in Louisiana, another in the French islands of St. Pierre Miquelon, France Amitie in Paris, and one from the Magdelene Islands of Quebec. FREDERICTON, New Brunswick (CP) - Acadians in the Maritimes are celebrating a decision by the federal government to issue a proclamation acknowledging the wrongs done to their ancestors during the expulsions of the 18th century. Euclide Chiasson, head of the Societe Nationale des Acadiens, said Wednesday the proclamation was approved by the federal cabinet during what was expected to be its final meeting with Prime Minister Jean Chretien earlier this week. "It was, to use the Latin phrase, 'in extremis,' because it was the last cabinet meeting," Chiasson said in an interview. "Up to the last minute, we didn't know if it would make the agenda. We have to thank (MPs) Sheila Copps and Stephane Dion who took leadership on this and pushed it through. We are very happy." The Acadian society wrote Queen Elizabeth several months ago asking the Crown to consider an acknowledgment of the expulsions, which began in 1755 and ended around 1763. Earlier efforts to seek a royal apology were dropped. Buckingham Palace responded by saying the Queen would need the advice of her Canadian ministers. "The proposal was put to the cabinet and we understand it was accepted unanimously," Chiasson said. A spokesman for Copps said an event is being planned for next week concerning the proclamation. No other details were available. Chiasson said the proclamation will be signed next week by Gov. Gen. Adrienne Clarkson. He said that in addition to acknowledging the deportation as part of Canadian history, there also will be a special commemorative day - July 28. "We finally have a document that recognizes the events surrounding that very sad part of our history," Chiasson said. "That, to me, is important. People are always revising history and undermining certain events. The fact that it is now recognized in this proclamation makes it a reality." Chiasson said 2005 is the 250th anniversary of the expulsions. He said the proclamation will be incorporated into commemorative activities. As well, he said it is hoped there will be a royal visit to the Maritimes during 2005. The decision by British governors to remove an entire ethnic population - the French-speaking Acadians - from the colony of Nova Scotia had consequences that resonated for generations. It's believed about 11,000 Acadians were deported from what is now the Maritimes. Some were sent to France and other parts of the world, but most were scattered throughout the American colonies. It's estimated another 3,000 hid in the region's forests and in Quebec. Others sailed south to Louisiana where, over the centuries, they lost their language and much of their culture in the huge U.S. melting-pot. There are now about 245,000 francophones, most of them Acadians, in New Brunswick, with another 34,000 Acadians in Nova Scotia and 5,500 in Prince Edward Island. The British Crown has made several "mea-culpas" in recent years, including to the Maori people of New Zealand who lost vast tracts of territory to land-hungry settlers over 130 years ago. It has also issued apologies relating to the Boer war, the Irish potato famine and for Britain's role in the 1938 appeasement of Nazi Germany that led to the end of democracy in the Czech Republic, then part of Czechoslovakia. As well, the British government recently offered "sincere regrets" for its home-children policy under which about 100,000 children, classed as orphans, were shipped from England to Canada between 1867 and 1939. Chiasson's ancestors hid during the deportation, finally settling in Cheticamp, N.S., when the expulsion ended in the mid-1760s with a peace treaty between France and Britain. He said lingering pain from being an unwanted and expelled people haunts Acadians to this day. He said their history has made the Acadian people who they are today and he believes their contribution, and suffering, needs to be recognized. "It's not a question of looking back," Chiasson said. "It's a question of looking forward and knowing who you are." The above-noted was written by CHRIS MORRIS of the Canadian Press and published in the Vancouver Sun Newspaper of December 3, 2003. Almost 250 years after the British deported Acadians from their Canadian homeland, Queen Elizabeth offered regrets Wednesday for the brutal treatment inflicted by the crown on the French-speaking ancestors of Louisiana's Cajun people. Lafayette lawyer Warren Perrin, president of the Council for the Development of French in Louisiana, launched a one-man campaign in 1990 to elicit an apology from the queen for the Acadian deportation of 1755. In recent years, Acadian groups on both sides of the Atlantic Ocean joined in the crusade, and the queen signaled several months ago she would act. The effort culminated Wednesday [ December 10, 2003 ] when the queen's representative in Canada, Governor General Adrienne Clarkson, signed a royal proclamation in Ottawa, the Canadian capital, acknowledging the expulsion and its tragic consequences. "It's never too late to right a wrong," Perrin said. "I feel a lot of relief for Acadian people everywhere." The first Acadian settlers left France and arrived in 1605 in the homeland they came to call Acadie. In the 1700s, as the British tussled with the French for control of North America, they overran Acadie -- modern-day Nova Scotia -- and ordered the Catholic Acadian inhabitants to swear allegiance to the British crown and, by extension, the Church of England. Those who refused were stripped of their possessions and thrown out of the country beginning in 1755. Thousands of Acadians were deported to France, the Atlantic colonies and other far-off places where they generally were not welcome. The expulsion, which came to be known as le grand dérangement, split apart many families, and as many as half of those deported died from disease, malnutrition or exposure, according to Carl Brasseaux, a noted Acadian historian at the University of Louisiana-Lafayette. The event, immortalized in Henry Wadsworth Longfellow's epic poem "Evangeline," was "one of the classic early episodes of ethnic cleansing," Brasseaux has said. Some of the displaced Acadians made their way to south Louisiana beginning in 1763. They were welcomed by the Spanish government and soon adapted their farming lifestyle of the chilly north Atlantic coast to the balmy, mosquito-ridden bayou country. Over time, their descendants, the Cajuns, carved out the region's predominant culture. One of them, Kathleen Babineaux Blanco, will be inaugurated next month as Louisiana's governor. Perrin said he is particularly pleased that Wednesday's proclamation responded to the three specific demands he made in his original petition: The British government made an inquiry into the circumstances of the deportation, it acknowledged wrongs that occurred and it made a symbolic memorial to the Acadians. The proclamation designated July 28 as an official day to commemorate the Acadians and the expulsion. On that date in 1755, a British military officer signed the deportation order. "At the time I drew up the petition, I didn't know what I was asking for, a cross maybe, or a pile of bricks somewhere," Perrin said. "To have a day to commemorate what happened to the Acadians, this is better." Since 1994, Acadians from throughout the world have gathered every five years to celebrate their ancestry and culture. The first gathering was held in New Brunswick, Canada; the second was in Louisiana in 1999. The third Congrès Mondial Acadien, or World Acadian Congress, will convene in the summer in Nova Scotia. "We'll have something special to celebrate now," CODOFIL spokeswoman Elaine Clement said. "I think we need to celebrate it for a long time." OTTAWA  Canada has officially recognized the deportation of the Acadians, almost 250 years after they were forced to move from their homes in what's now the Maritimes. Heritage Minister Sheila Copps made the proclamation Wednesday in Ottawa as the federal government's acknowledgment on behalf of Queen Elizabeth. Several months ago, the Société Nationale des Acadiens petitioned the Queen to acknowledge what happened in 1755. Acadians were forced to leave after refusing to swear allegiance to the English. Some went to France while most were scattered throughout the Americas. The response came back from Buckingham Palace that the Queen would defer to the judgment of her ministers in Canada. That's when the federal cabinet endorsed the idea to acknowledge the deportation and to recognize July 28 as the anniversary of the deportation. "I think this recognition, this proclamation is very important for our people," said Euclide Chiasson, head of the Société Nationale des Acadiens. Gov. Gen. Adrienne Clarkson said she's pleased to be part of this historic proclamation. "The Acadian community is an example of a community that has just burgeoned and bloomed and blossomed in the last two to three decades, which is astonishing," she said. "It has to do with the way they are and are proud of being the way they are, so I was very happy to sign that proclamation." New Brunswick's Lt.-Gov. Hermenegilde Chiasson hopes the proclamation will help some people put the past behind them. "I've always believed that the future is more important than the past, but I know that for some people it is important and in that sense, if it can help them turn the page and start onto something new, I think it's very valid," he said. July 28th, 6:00 p.m. ~ Acadian deportation "Day of Commemoration" Memorial Service held at St. Martin De Tours & the Acadian Memorial & Meditation Garden. As mandated by the Queen's Proclamation of December 9, 2003, and with the support of the Catholic Diocese of Lafayette, we request that all churches in the Acadiana region please toll the church bells at 6:00 P.M. on July 28th, 2009 in remembrance of the day that the Acadian Deportation Order was signed by the British officials in Halifax, Nova Scotia. 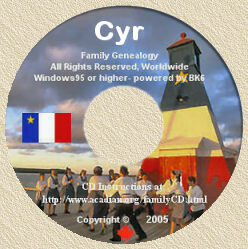 Warren Perrin, instrumental in bringing awareness to the Canadian Parliament states, "Over 250 years after the defining tragic event of Acadian history, we will pause to remember the unparalleled saga of our ancestors because, as was stated in dictum by William Faulkner, ' The past is never dead. It's not even past '. The desirability of an official apology to the Acadians became the subject of debate in the Canadian Parliament and within the Acadian community. In 2003, the Society Nationale d'Acadie, -- the largest Acadian organization in the world-- wrote directly to the Queen of England "asking that she ' recognize the wrongs done to the Acadian people as a consequence of the deportations from 1755-1763' in order "to turn the page definitely on this tragic episode in our past". As I look back upon the Petition For An Apology, which I launched in 1990, I'm very gratified to have played a role in bringing about this closure."